Last Friday, the final Mazda RX-8 Spirit R rolled out of the factory in Hiroshima. Not only did it mark the end of a true enthusiast model, but it brought about the end of the rotary engine. For Mazda, the tradition began with Cosmo Sport back in 1967. During that time, Mazda has produced almost 2 million rotary engines. Heralded for its smooth high-revving power output in an extremely compact layout, the rotary engine was originally developed by Felix Wankel in 1929. Traditional combustion engines utilize fixed combustion cylinders with pistons that move up and down. 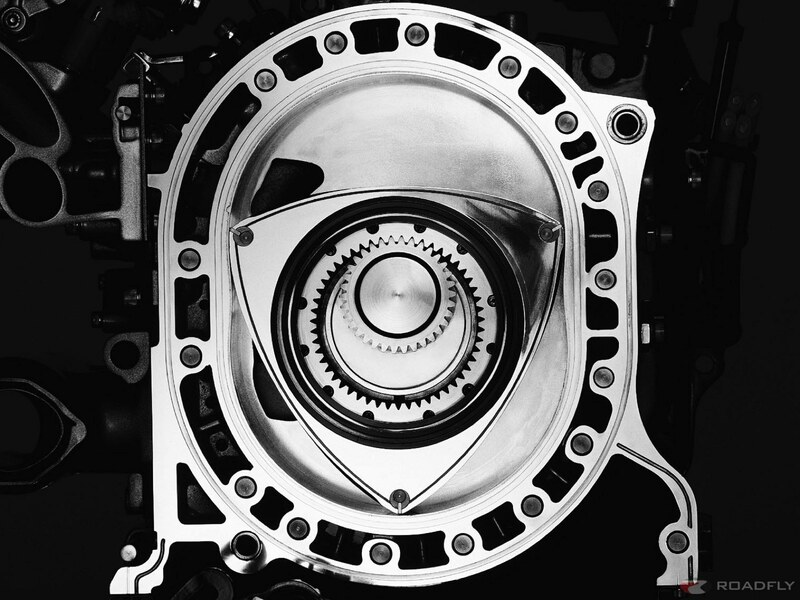 The Wankel rotary engine utilizes triangular-shaped rotors encased in a large oval-shaped housing. As the rotor spins, it moves through the combustion cycle. The intake, combustion, and exhaust phases all happen as the rotor continues its rotation, providing its trademark smoothness. Further, the lack of any pistons and exhaust cycles found in typical cylinders allow for much higher RPM levels. The first working prototype developed a mere 21 horsepower. The technology was licensed to many different car companies. However, Mazda is best know for refine the technology in its road and race cars. 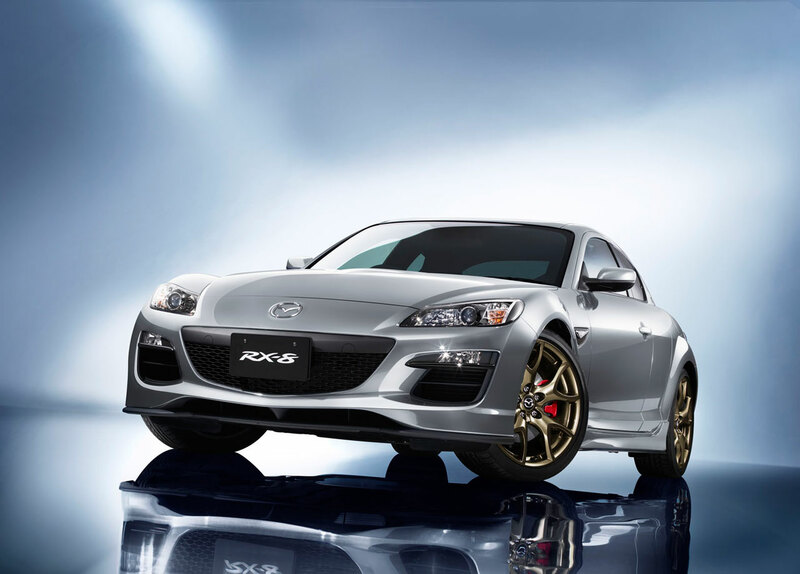 The outgoing Mazda RX-8’s 1.3 liter twin-rotor Wankel rotary engine produces 232 horsepower at an astounding 9,000 rpm. That’s over a 1000% horsepower increase during the engine’s 83 years of existence. Sadly, the search for more power isn’t the reason why this engine is being discarded. The Wankel rotary engine has some unique challenges, like lubricating the engine components. They are notorious oil consumers because of the necessity to oil the seals of the rotors. With no distinct combustion zone, some of the oil is lost in the combustion cycle. In addition, less uniform combustion means some of the fuel doesn’t burn. This excess fuel is exhausted, lowering mileage. These factors were part of the reason why the Mazda RX-8 failed the Euro 5 emission standards set in 2010. This failure prevented the car from being sold in Europe. The RX-8 Spirit R was a 1000 unit Japanese-market final edition, featured special Recaro seats and 19″ bronze alloy wheels. Since the models debut in 2003, nearly 190,000 RX-8s have been produced. With no successor announced or planned, it’s difficult to say what Mazda will do. They’re set to redesign the MX-5, hoping to recapture the lightweight roadster market. Perhaps we’ll also see an RX-8 replacement in the form of some competition for the new Scion FR-S and Hyundai Genesis Coupe. That’s unlikely, however, with Mazda’s growing focus on their SkyActiv technology. Mazda officials are also hesitant to mark this as the true death of their famed engine. It’s possible we would see some form of rotary engine adapted into a hybrid platform, perhaps even a hydrogen-fueled rotary variant. For now, enthusiasts, take a moment and note the passing of yet another legendary engine lost in the name of efficiency.